Your point is taken, but the questions associated with the table imply that you feel there is some meaningful association between numerical and statistical parameters in and of themselves, and the concept of fairness. In my opinion, this is a red herring. Neither of the three options (i.e., average, median, or dropping lowest score) is inherently better than the others. Any “fair” choice must be based on meaningful criteria derived from knowledge of the variables that produce the grade spread, and weighed against desired outcomes. Each of the approaches implied in the table reflect poor assessment practice. That would seem to be the point of the table? None of the approaches in any way articulate what students can do, where they are going, or how they might best get there. None of this assists learning. It is surprising that education communities still support the approaches set out. I am surprised to see deck chair placement discussions in this day and age. Schools in Sydney ditched the old model in the 80’s. I look forward to examples of good assessment/feedback. The greater problem is the whole idea that what is important can be easily measured (and given a numeric value) is important and whatever cannot be easily measured is not important. A life-long interest in science or love of reading does not get a score on standardized test. Sadly, this is not limited to education. Our whole society suffers from the idea that pay equates with the value of the job or that being well compensated means that you do something valuable for society. Didn’t this originally come from an article by Tom Guskey? This should be acknowledged. I wish the image was “annotatable” and people could point out all the things wrong with the table. I’d be curious to see specifically what people actually see as bad about the table. I think that questioning these numbers is a first step and the next step is to dig into the grade book. In doing so you find out how much of the grade is based on demonstration of knowledge and skills and habits. I’m always amazed by the diversity of assessment strategies. Grades for homework and participation don’t tell us what the student knows and is able to do. We are making significant changes to our practices and it is definitely time. I still can’t believe that people have trouble understanding how giving zeros is unethical. I know that Ken has been promoting abolishing zeros for years. Even math teachers can’t agree to making this change. If you’re looking to make changes, just read follow the gurus O’Connor and Guskey. They provide us with rationale and examples for change. 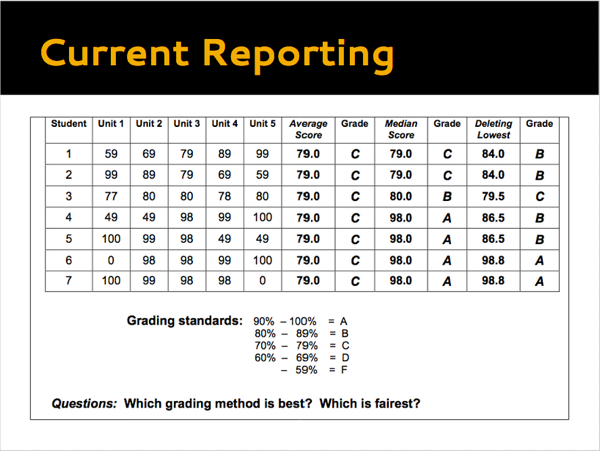 The one thing that we are struggling with is the purpose of grade reporting. We can’t seem to narrow it down to a few since their are several audiences. Take away the averages and change unit to learning objective and it works for me. I think we have become demagogues when it comes to grading – everyone pokes holes in the current system but few have a good answer. We have a difficult challenge on our hands – how do we measure student learning and teacher effectiveness? As long as leaders in our society demand that we shift responsibility for learning from student and parents to teachers, we will continue to debate what is fair and equitable. In the meantime, the debate is about what can teachers do to somehow get students to learn when many choose not to do so. Through out grading altogether, give students and parents choices about what and how deeply they learn, and give meaningful reports about what concepts have been learned is all that is necessary. Telling a student he got an A in 3rd grade math, a B in 4th grade math, and a C in 5th grade math doesn’t tell the student, parents, or perspective colleges and employers anything. Yet as screwed up as we are, if I say a student achieved a 6th grade education in mathematics in his 12 years of public education, it has some meaning and we get a descent idea of the students capabilities. Isn’t standards-based grading the answer? What if the lowest grade is the most important concept? That is the problem with scoring. There should only be two grades: A or incomplete. That’s the quickest way to mediocrity. How so? As a teacher I give non-acceptable work back to students to redo (again and again and again…). I will not let students off the hook with a low grade. Eventually (and quickly) all students are doing quality work….and more importantly…learning the material. I do not let my mechanic, or dentist, or barber do 60% work without making them fix it. Why do we allow anything less of students? I read the first statement as something along the lines of a pass/fail model and that often leads to “I’ll do whatever I need to in order to simply pass” instead of actually putting forth effort (or I’ll get someone to make a stink and you’ll have to pass me). Now that you’ve elaborated and stated things more specifically, you make sense. Okay, then can I also get rid of my SMART Goals and the grades for my school and everything else that I’M getting evaluated on? Or is that still okay? How often would you see grades that looked like those for students 4-7? Never?